From humble beginnings in 1987, Parkson has become an Asian retail success story. Over the past 27 years, the Group has built an unrivalled reputation as Asia’s leading department store through our continuous innovation, vision and customer-first ethos. Parkson has grown in tandem with Asia’s economic emergence – venturing beyond Malaysia to open our first store in China in 1994, followed by Vietnam in 2005, Indonesia in 2011 and Myanmar in 2013. Parkson Group encompasses 3 entities listed on the stock exchanges of Malaysia, China and Singapore. These listed entities are Parkson Holding Berhand (listed on Bursa Malaysia), Parkson Retail Group Limited (listed on the Hong Kong Exchange) and Parkson Retail Asia Limited (listed on the Singapore Exchange). Valid at all Parkson outlets in Malaysia. The value of this voucher is in Malaysia Ringgit. This voucher strictly not exchangeable for cash and re-validation. Purchases exceeding the value of the voucher are to be borne by the bearer. No refunds are applicable for purchases below the amount stated in the voucher. 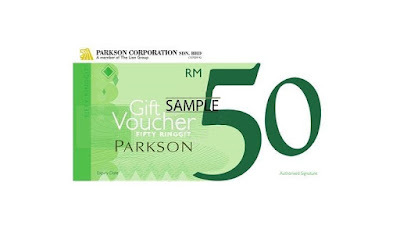 Parkson is not responsible for the loss or damage of this voucher and any of the losses or damages suffered by the bearer of this voucher that arise from or in connection with the loss or damage of the vouchers. Damaged and lost vouchers will be considered as invalid and will not be replaced. Parkson reserves the rights to change, modify or amend the terms & conditions at any time without notice.